I don't feel like I am any further forward and would be grateful for any help! LOL! 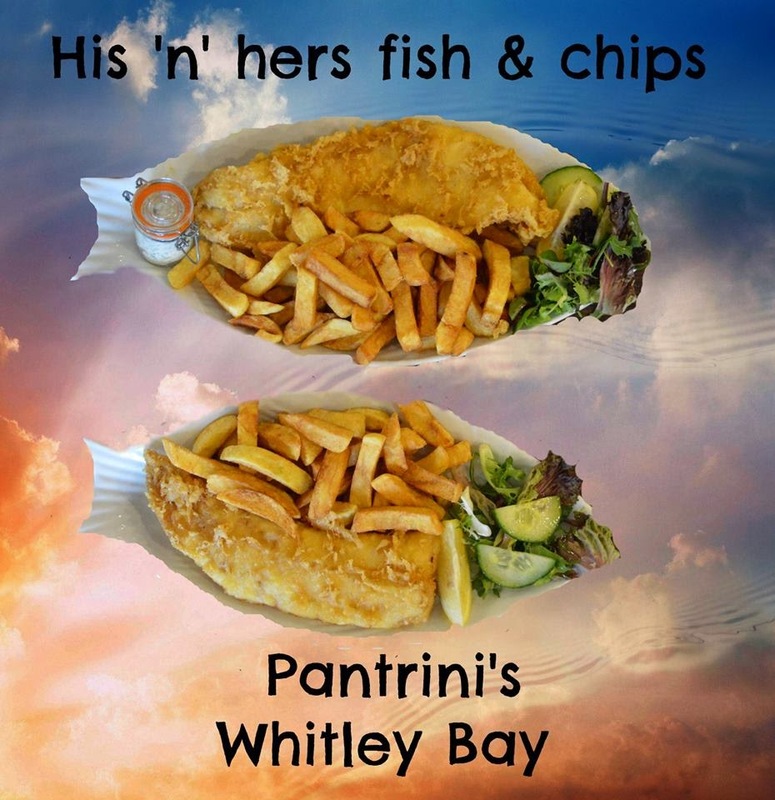 Whatever the reason behind it though, you just can't beat fish and chips on Good Friday (well in fact anytime when you're beside the sea) and we are delighted to be working with Pantrini's in Whitley Bay to give away a voucher for family fish n chips. Pantrini's is situated just a two minute walk from the beach in Whitley Bay on Marine Avenue. It is an ideal location for a family treat with play parks, the beach, the library and amusement arcades all within easy walking distance. There is free parking behind Whitley Bay Playhouse too. Pantrini's offers the option to either eat out or take away. We decided to eat in and found there was plenty of seating both upstairs and down. The staff were wonderful with our children and took the time to chat to them about their day and bring them special seaside themed colouring sheets and crayons. The children's meals are extremely good value - freshly cooked cod and chips with a juice drink for only £3.50 is a very good deal and we loved the special fish-shaped plates. Sometimes I find fish and chips to be far too generous in their portion sizes and end up feeling sick! I'm pleased to see Pantrini's offer both regular cod and chips (£5.99) and a larger version (£7.29) for those with bigger appetites. The regular size was perfect for me. Our fish and chips were wonderful, light and not at all greasy. It's not often we all have clean plates but we managed it at Pantrini's. We were even brought our own bowl of batter which really impressed our children! Pantrini's is a family-run business now in it's 4th generation that dates all the way back to the turn of the 20th Century (you can read about the business history here). They have strong values and always believe that the customer is at the core of their business. All of the staff we encountered were happy, friendly and genuinely seemed to care that we were made to feel welcome in their restaurant. We thoroughly enjoyed our fish and chips at Pantrini's and will no doubt be returning several times in the next few months, especially as the weather warms up as there's nothing like fish and chips on the beach. 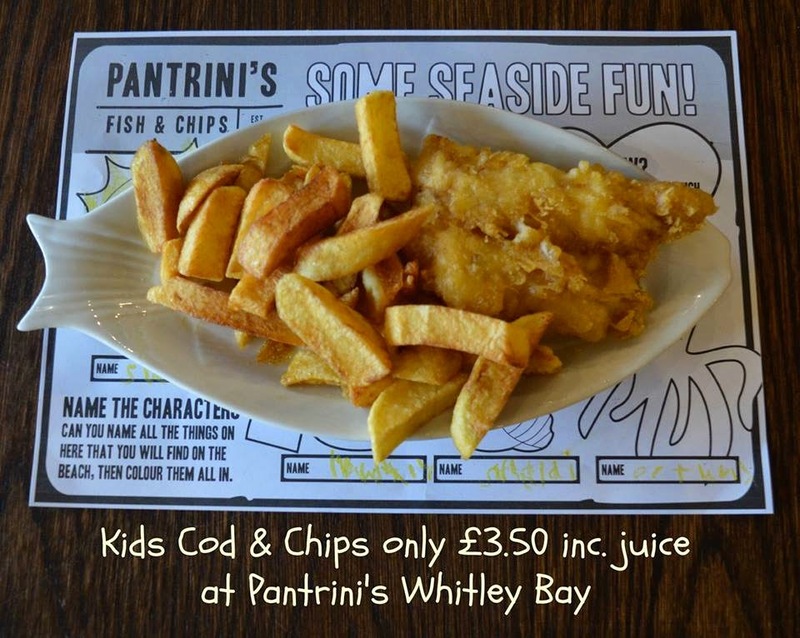 Now is your chance to win 2 x adult meals and 2 x children's meals at Pantrini's Whitley Bay. Simply enter using the RaffleCopter Giveaway below. Good luck! I don't know either but always assumed it was partly the feeding-of-the-5000 thing and partly the symbolism of eating meat / flesh. I suspect it was maybe decided by the fishmongers around a year after the chocolatiers got away with their whole chocolate egg swindle! I think it's a mix of not being able to eat meat and also Good Friday is a family day, parents are off from work and - weather permits - everyone goes out and and easy meal to get on the go is fish and chips. I went to Whitley Bay last year, the weather was gorgeous so it was packed! Many families going on the rides at the Links and people sitting around having their fish and chips. The same goes for Tynemouth, people buy their fish and chips and sit by thr priory or the benches on King Edward's Bay. love fish and chips anytime and Patrini's is one of my favourites. Catholics are supposed to eat fish every Friday. We eat fish on Good Friday (I think) because Catholics abstain from flesh meat on Good Friday, although fish is permitted. We are not Catholics but I was brought up eating fish on Good Friday so still do. I don't mind as I love fish! We are having Fish Pie this evening! We love Pantrini's too! I live in Whitley Bay so Pantrini's is a walk away! Current church law states that the days of abstinence fall during Lent, the season of spiritual preparation for Easter. On Ash Wednesday and all of the Fridays of Lent, Catholics over the age of 14 are required to abstain from meat and from foods made with meat. Prior to Vatican II every Friday was meat free. Fasting from meat has always been a part of Lent, it led to odd decisions in the Middle Ages about what exactly counted as fish, pretty sure ducks were classed as fish! Growing up in a Catholic household we always had fish on a Friday, I think the tradition of fish and chips on Good Friday is just a left over from these old customs. It's the Catholic way. Plus they're damn tasty!! No idea but my nan would always have fish on a Friday and I do the same. Its a 'fast day' and fish is not classed as meat so it can be eaten. Its not just on Good Friday, my children are Catholic like me and the rest of my family and they have fish for school dinners EVERY Friday, alternating between Fish, Fish Fingers and FishCakes. because your not meant to eat meat on friday so you eat fish instead.